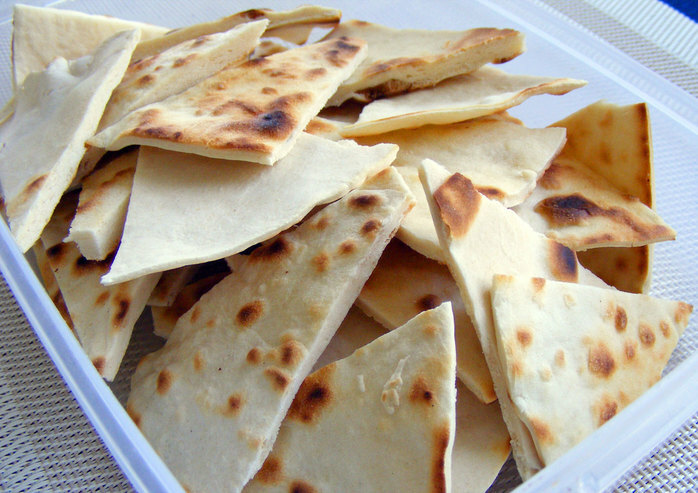 There are a number of different types of flat bread that you can make. 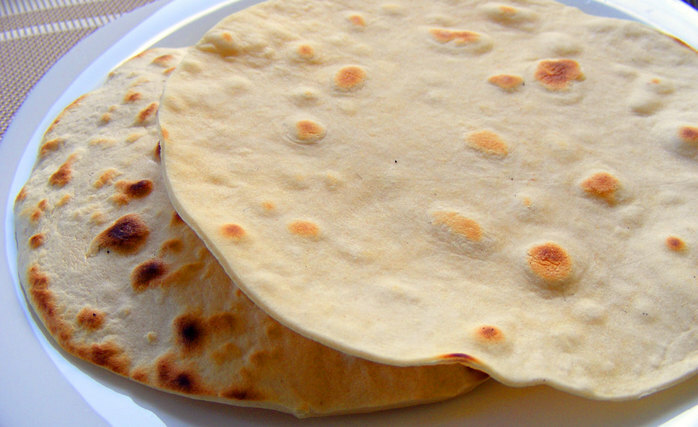 One of the easiest, most delicious and highly versatile flat breads are tortillas. 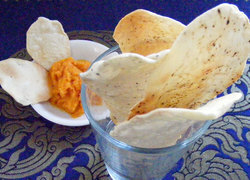 I usually make medium sized tortillas to cut into wedges to use with dips. While tortillas are pretty easy to make, they can be a little finicky, but with a little trial and error it is fairly straightforward to make the perfect tortilla. The recipe below is made with 1 cup of flour and makes enough tortilla triangles to fill up a lunch box for a party to serve with a dip. 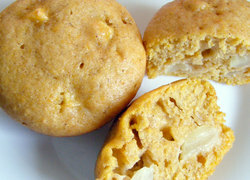 But it is easy to simply double or triple the ingredients to make more. 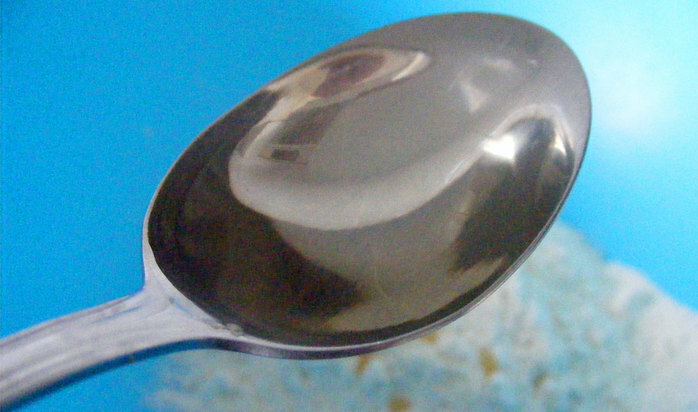 Add in one table spoon of oil and mix. Traditionally olive oil is used, but you can vary the oil for different flavours. 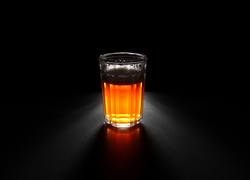 I prefer a light flavoured oil, such as light olive oil or sunflower oil. 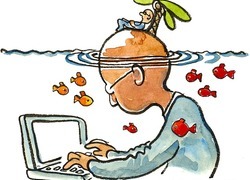 Add a little bit of the water to the mix. 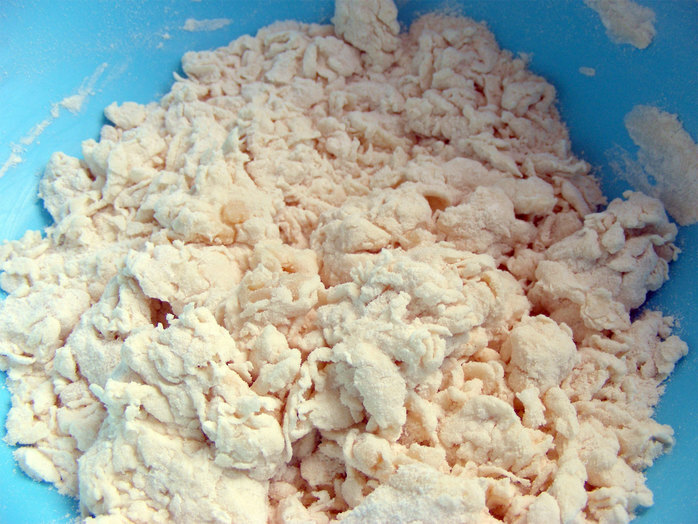 Like other types of bread dough, you have to make sure that the amount of liquid is just right. 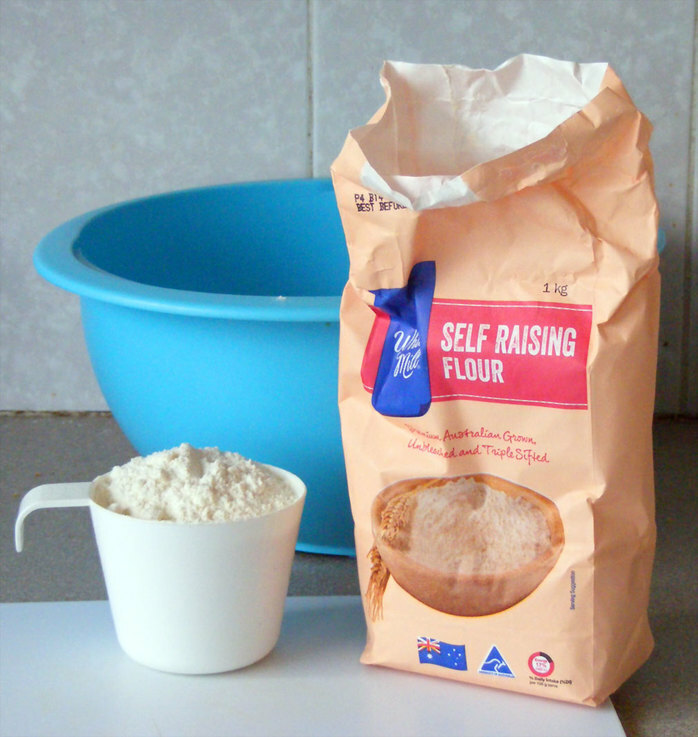 In the photo below you can see I have just stirred it with a spoon, and while it looks dry it will knead together into a ball once I start using my hands. 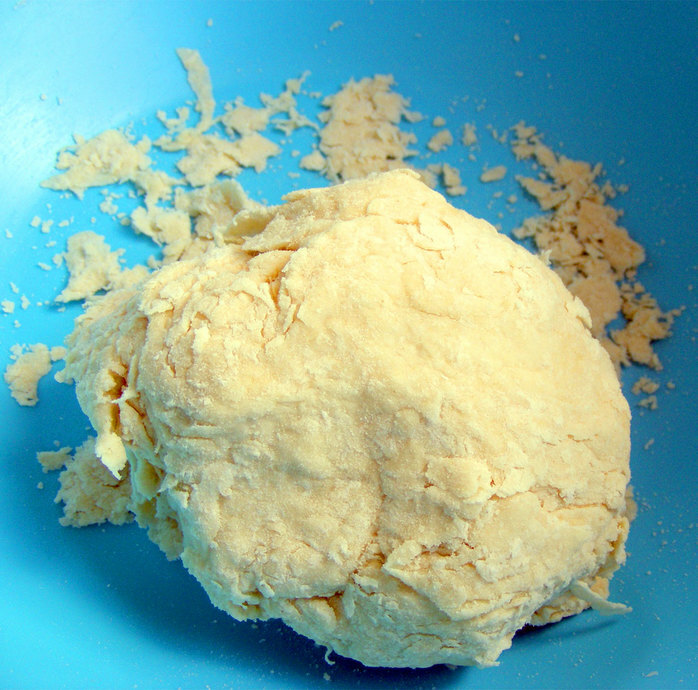 The next photo is the dough after I have kneaded it with my hands. You can see it is a little dry, so I want to add a little more water, just a drop at a time. The consistency should be dry enough so it doesn't stick to your hands but wet enough that it doesn't crack as you knead it. Now I have it just right using most of the 1/4 cup of water I set aside. 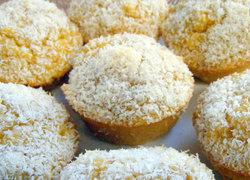 I have to admit, I ended up adding too much water and had to add a little more flour to make the mix perfect. 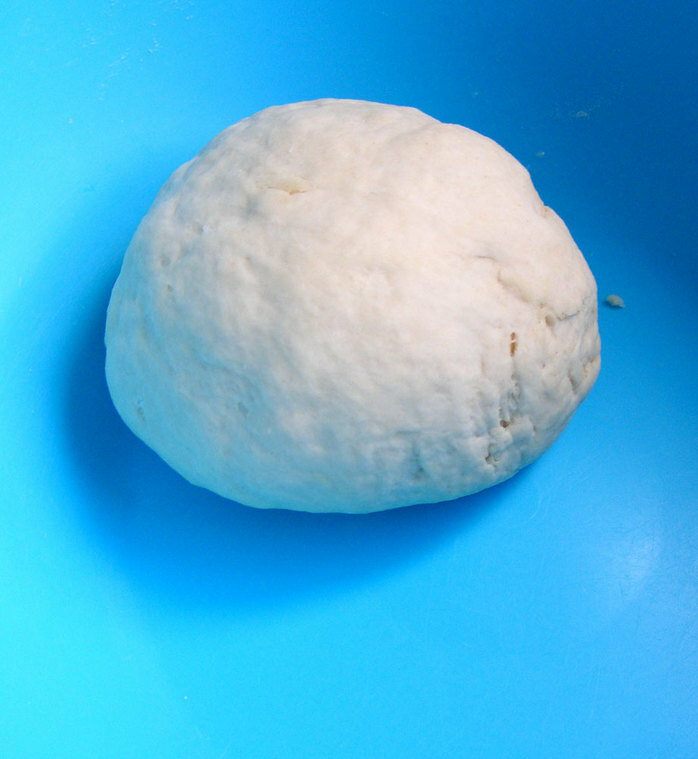 Grab a nice sized chunk of the dough and form it into a little ball. 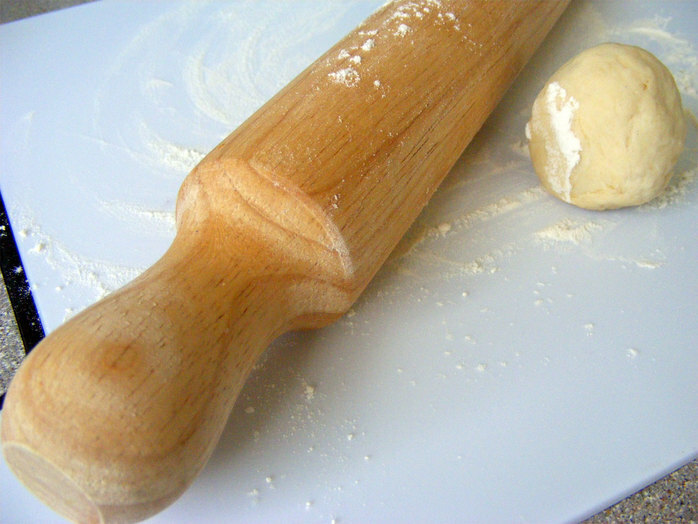 Now flour a flat surface and rolling pin so that you can roll out the dough. 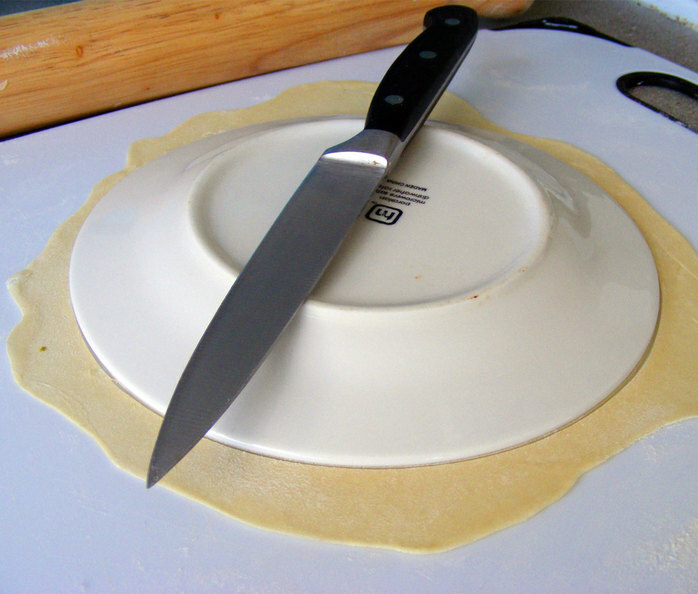 I use a large cutting board because I will cut the pastry to make a perfect round shape. Of course if you have stainless steal work surfaces in your kitchen (lucky you, I am soooo jealous) you can just use that. 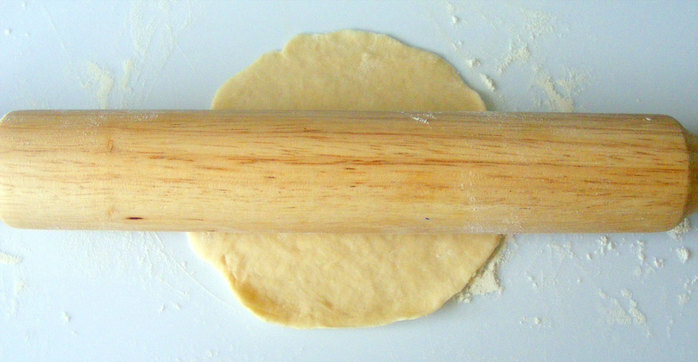 Start to roll out the pastry with your rolling pin. In theory you can just use the palm of your hand to do this, but I can never really get it to work right. Keep going, trying to keep the pastry in a nice disk shape. The advantage of using a cutting board is that I can spin the board around around to roll out the pastry at different angles to keep it as round as possible. The pastry is fairly springy and if you are instead trying to spin the pastry itself it will tend to clump up and it will not remain lovely and smooth. 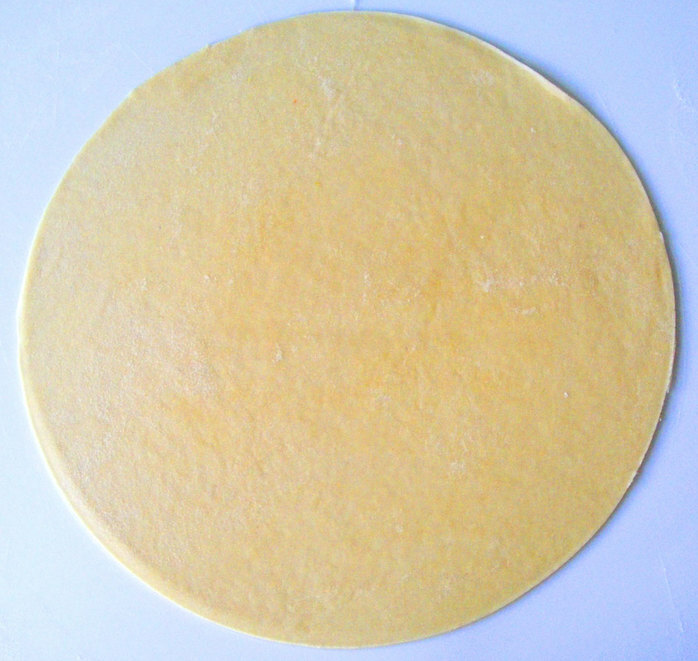 You want your tortilla to be thin, but not wafer thin. 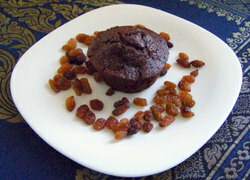 If it is too thick it won't cook nicely and if it is too thin it will became crispy when you cook it, instead of soft. As the dough becomes thinner it is harder to keep it in a good disk, so I grab a plate and cut around the the edge to form a perfect disk. 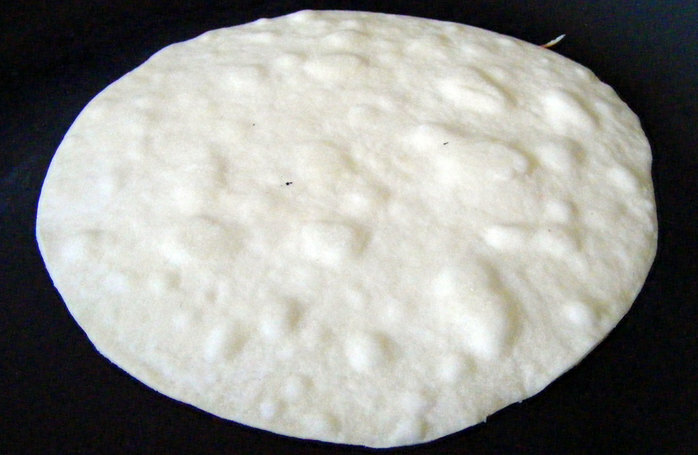 Here we have a nice thin round tortilla ready for the pan. Place the tortilla in a medium hot pan. 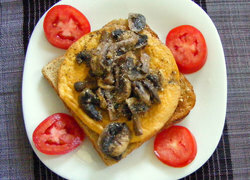 I have an old pan that I use for flat breads as the high heat used with most pan breads can warp your pan a little. 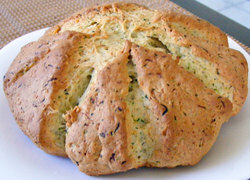 Ideally though you will want to use an old fashioned cast iron pan.You will see the bread start to bubble fairly quickly and, depending on the temperature, it should be ready to turn over in less than a minute. You will see the difference if the bread is too thick, as you can see from the tortilla below that I intentionally (well intentionally by accident) made thicker than the first one. 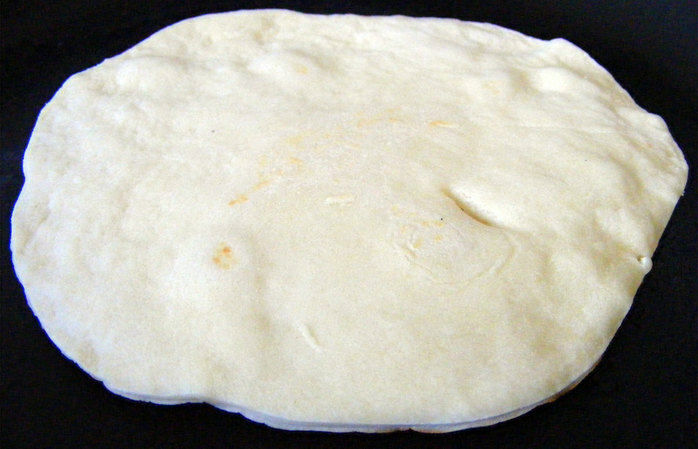 It won't bubble like the thinner tortilla and the result will be a tortilla that lacks a properly light texture. Most of the time and effort for this involves rolling out the tortillas. After a little practice you can have a new tortilla ready to go into the pan by the time the first one is cooked. 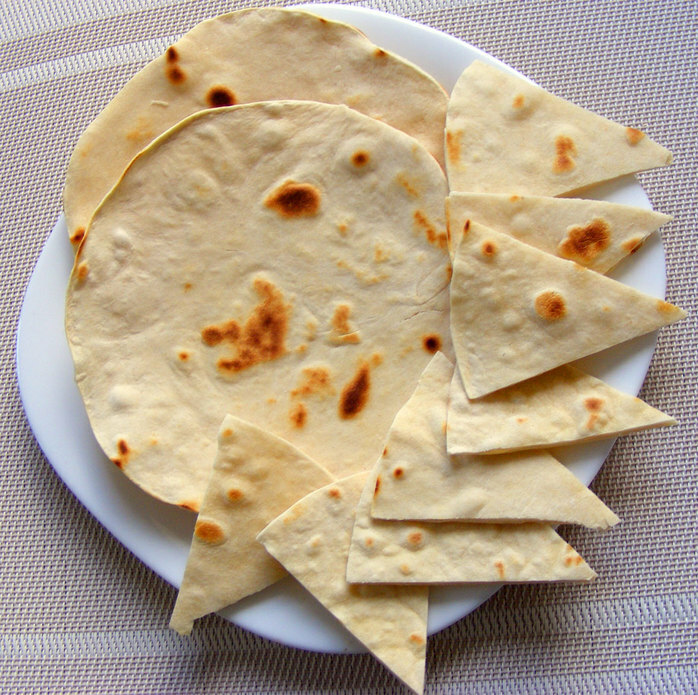 These tortillas are smaller in sized and are just the right size to cut up into little triangles to serve with dips. 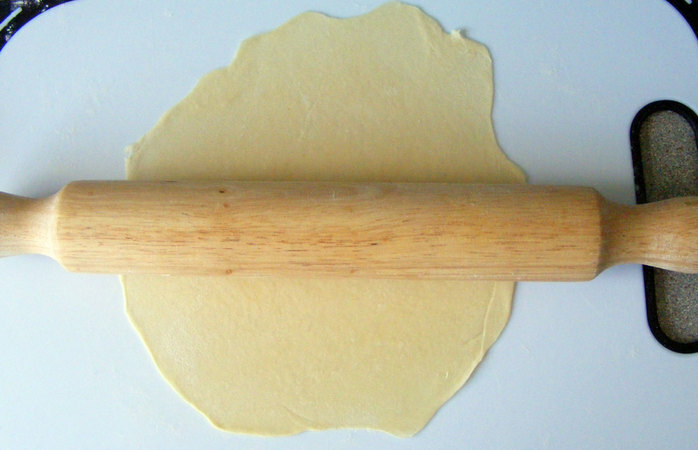 If you want larger ones, it is just a matter of using more dough and a larger surface to roll it out. 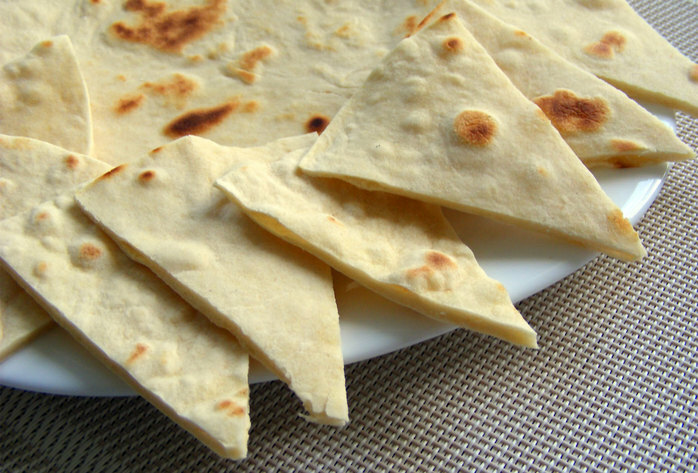 1 Cup of flour is enough to fill up a lunch box with tortilla triangles (as you can see from the image below, even though I ate 1 and a half tortillas while cooking). Now I just have to make dip and I am ready for the party.